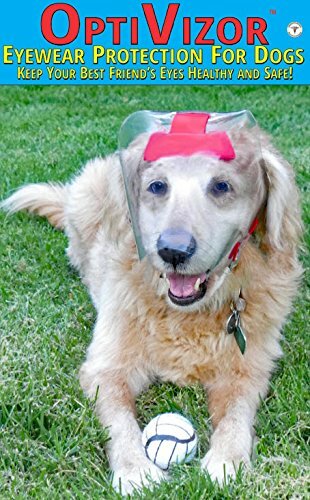 Optivizor Regular Snout Advanced UV (Clear UV or Dark UV) Medical/Preventative Eye Wear Protection (Goggles/Sunglasses) for Dogs (Clear UV Tint, Size Medium) by Optivizor at People For Pets. MPN: PO4. Hurry! Limited time offer. Offer valid only while supplies last. SAME DAY SHIPPING! FULLY ASSEMBLED! The purchase of an Optivizor should be one you make after understanding all the benefits it provides your dog. SAME DAY SHIPPING! FULLY ASSEMBLED! The purchase of an Optivizor should be one you make after understanding all the benefits it provides your dog. Please read all the information & let us know if we can help to make the correct decision. Designed to provide your dog with a totally New & Innovative type of lightweight effective protection excelling in Safety & Functionality. Superior protection for: Post Eye or Facial Surgery; Eye Diseases; Blindness; Photo-Sensitivity; Search & Rescue / Police Dogs / Hunting Dogs. Strong Yet Flexible. Soft UV Tinted material. This gives superior protection from dust, wind, or any bumping into the eyes. Clear (92% UV) and Dark (90% UV) Tinted protection which offers a 30% greater Shade factor. Unobstructed full field of vision. Comfortable ergonomic headrest which forms around the the head to provide greater comfort & stability, ideal ventilation, & ensures a correct distance to the dog's eyes. The ears remain outside eliminating 'echoing', 'disorientation', & possible ear/yeast infections. It moves with the dog's head & doesn't flop about or slide down the neck regardless of the activity. The neck strap & cheek strips provide greater individual sizing. Expanded Sizing Options. Review the sizing chart to help determine the correct size for your regular snouted breed dog. If you are in-between sizes - we recommend going with the smaller size. NOTE: the sizing charts are to used as a guideline and do not guarantee an exact fit. Please note that Protective Pet Solutions shall not be held liable for any injury to an animal sustained as a result of the proper and reasonable use of our products. SHOULD YOU HAVE ANY QUESTIONS ON SIZE OR SITUATION ON YOUR DOG (OR CAT), PLEASE SEND US A MESSAGE AND WE'LL BE HAPPY TO HELP! WE ARE EXTREMELY KNOWLEDGEABLE WITH THE OPTIVIZOR & WANT THE BEST FOR YOU & YOUR FOUR-LEGGED ONES! ONLY COMPANY THAT SHIPS REGULAR SNOUT OPTIVIZORS FULLY ASSEMBLED & SAME DAY when ordered by 3PM PT! New & Innovative Superior Protection Designed for your Dog's Medical and Preventative Eye Health Needs. Allows full field of vision while staying securely in place during all activities. Used and Approved by Pet Parents, Veterinarians and Leading Veterinary Teaching Hospitals! FREEDOM OF MOVEMENT: No more bumping into furniture, doorways & YOU! Easily goes through the Doggy Door, Eat, Drink, Play & Sleep! EARS ON THE OUTSIDE prevent distorted sounds/echoes while still being able to scratch their ears. ERGONOMIC HEADREST provides stability, comfort and proper airflow. FOR MORE IMPORTANT DETAILED SIZING HELP, please visit before ordering our website at www.protectivepetsolutions.com/optivizor-sizing.html. Dogs accept the OPTIVIZOR so much better than any traditional E-Collar type products allowing them to heal more quickly. Let us help you! Sizing help is also available by contacting us via email with your dog breed, weight and head measurement - Protective Pet Solutions. Take pics of your dog and send to us for free online evaluations before & after the sale! If you have any questions about this product by Optivizor, contact us by completing and submitting the form below. If you are looking for a specif part number, please include it with your message.